Christmas in France -- Let's have it ! Nice quiet day today, getting ready for a meal tonight since the French celebrate much more on the evening of Christmas Eve than on Christmas Day itself. Some older children open their presents just after midnight in some families, while the younger ones still wait for Santa to deliver overnight. 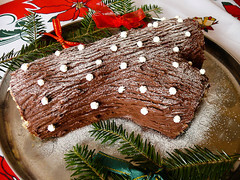 Traditional meals often include salmon, foie gras, goose, game birds or duck, and as dessert a Christmas “Yule log” of which many types are available. All this washed down with champagne and wine, of course. In some regions – like Burgundy – they might have snails as a starter while in Brittany there will be more emphasis on seafood. We won’t be doing a full traditional meal, though we might have a Yule log and some wine. No turkey in sight here, though! Have a good Christmas and enjoy some Christmas jokes while you’re surfing away biding your time until you can open your presents. This entry was posted on Friday, December 24th, 2010 at 2:04 pm and is filed under France, general. You can follow any responses to this entry through the RSS 2.0 feed. You can leave a response, or trackback from your own site. Passionate kiss like spider web - soon lead to undoing of fly.